Tomorrow, I have to go for two ultrasound scans. To say the least, the last few weeks have been a rollercoaster. Already dealing with having our lives torn apart for the last year, as we have had to undergo a near total renovation of our house. This required moving out, having all our belongings packed by a less than careful mold remediation company and now dealing with a less than ethical contractor who took a large deposit on work he never even started. So, now on top of everything, we are starting the litigation process to bring this contractor and his partner (wife) to justice and get our money back. They have caused us weeks of delays and much angst. I ended up being rushed to the hospital one night thinking I was having a heart attack. They found out that, thankfully, I was not having a heart attack but tomorrow I need to have an echocardiogram to rule out mitral valve prolapse and my thyroid levels (I am hypothyroid) were very low. This could be the reason for the chest pain etc. I had my levels tested again and they are normal but the doctor felt an enlargement in my thyroid, and that is the other scan I am going for. I would love your prayers and good thoughts because I am feeling a big weary. Speaking of being weary, motherhood itself can leave us feeling overwhelmed. Add to that health issues, and it can sap our energy as we worry about something happening to us, and what that would mean to our family. As much as we try to stay positive, those negative thoughts creep in. Since I was told there was an enlargement on one side of my thyroid, it feels that the fullness I felt from time to time in my throat, is now constant. It also feels like something is pulling from my collarbone when I turn my neck. As much as I try to push it from my thoughts, they find a way of creeping in. This morning, I woke up at the crack of dawn, and could not lie there because of the thoughts that kept coming into my mind. I had to get up and do something to try and take my mind off tomorrow. As mothers, our lives are so full and no matter how much we get accomplished, we tend to focus on all the things we did not get done. We are so critical on ourselves. It can easily leave us feeling overwhelmed. Maybe you have even wondered if you were succeeding at motherhood. We tend to berate ourselves about everything we did not complete or do. Worse yet, social media has introduced us to hoards of “supermoms” who only make us feel worse about ourselves. We have to understand everything is not what it seems on social media, and the “supermom” you see, is probably hanging by a thread just like you are many days. I understand that many mothers feel overwhelmed and have at least fleeting thoughts of inadequacy. 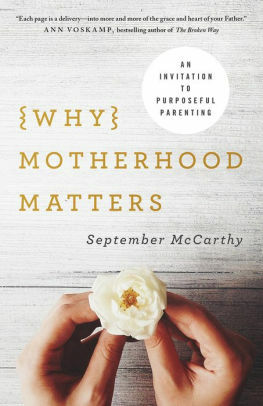 That is why I want to introduce you to, Why Motherhood Matters by September McCarthy. The author has been a mom for 25 years (close to how long I have been a mother but, I have a few years more on the job, lol), like myself ,she continues to raise young children and loves her young adults. September imparts words of wisdom and grace in key areas of Christian parenting, including faith (getting honest with your family about your need for Jesus), wellness (learning to take care of your kids and yourself), education (raising a new generation with creativity and character), and relationships (speaking to the heart of your children in unique ways). 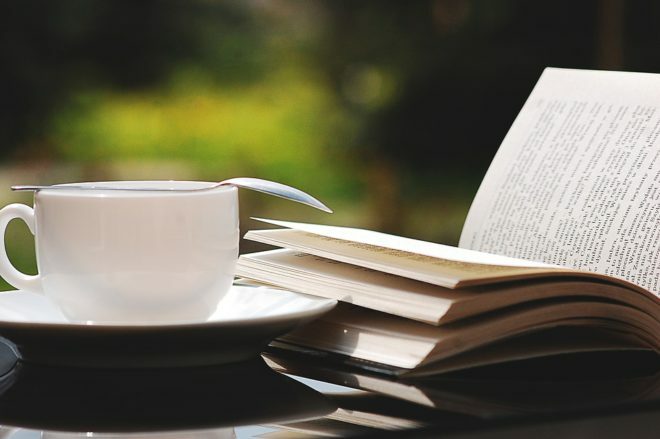 On the pages of the book, you’ll find sweet anecdotes and gentle guidance for those moments you need both a breather and a lifeline. September McCarthy is a writer, speaker, blogger (One September Day at www.septembermccarthy.com), wife, and a home-educating mother to ten beautiful children. Today, she juggles motherhood and being a grandmother as her older children are married with families of their own. She is also the founder and director of Raising Generations Today, a nonprofit ministry designed to equip and inspire moms to reach the hearts of their children for God’s glory. We are happy to run a giveaway for our readers. One lucky Mommy Ramblings’ reader will win their own copy of, Why Motherhood Matters. Enter using the Rafflecopter widget below. Open to residents of the USA. Enter using the Rafflecopter widget below. Good Luck!!! I was provided with a copy of this book to facilitate my post. As always, my words and views are 100% my own. Sleep – or lack of sleep! i struggle with finding balance. I can’t possibly list them all. I have one teen who wants to transition from male to female, and one teen who just got out of a mental institution due to being suicidal. Hello, I’m Carolyn! I am a PR Savvy, WAH Mom to 5! I love Photography, Baking, DIY Projects, Crafts, Cooking and making memories with my family. I love sharing reviews and giveaways too! Visit Mommy Ramblings-Carolyn Matri-Kavarnos’s profile on Pinterest.